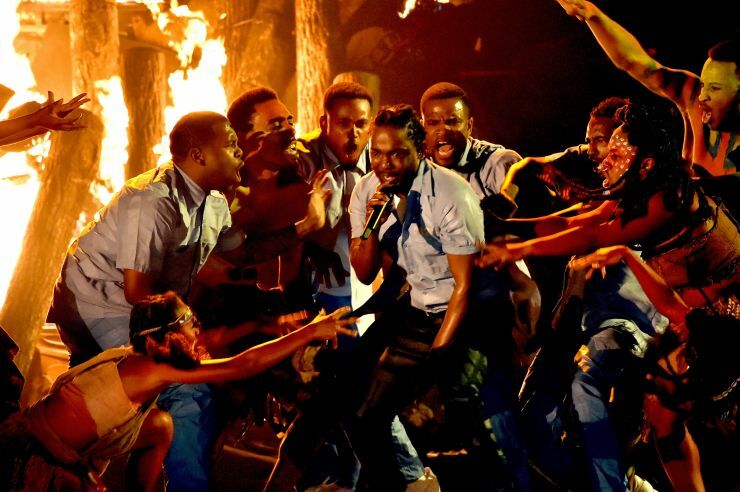 Kendrick Lamar gives a fiery performance at the 58th Grammy Awards. The 58th Annual Grammy Awards proved why it is still the biggest night in music. Hosted by L.L. Cool J for the 5th consecutive year, the show had a slew of performances, including a stream from Broadway’s Grammy-winning “Hamilton.” Ed Sheeran took home the award for Song of the Year, Meghan Trainor won for Best New Artist, and Mark Ronson and Bruno Mars won Best Record. Taylor Swift opened the show with a performance of “Into the Woods” from her album “1989,” which won Album of the Year and Best Pop Vocal Album. We also saw performances from Justin Bieber, The Weeknd, Adele, Lady Gaga with a tribute to the late David Bowie, and a tribute performance to Lionel Ritchie featuring John Legend, Demi Lovato (who surprised a lot of people with her awesome vocals) and Tyrese among others. The show was also a huge night for Kendrick Lamar. Before the show officially started, Kendrick Lamar had already won four of 11 Grammys he was nominated for (he even beat himself for some of the nominations); during the show, he won Best Rap Album. His performance during the show was electrifying to say the least. He came out in prison shackles and performed “The Blacker the Berry” and then blended that with a performance of “Alright” with African dancers in front of a fire pit.